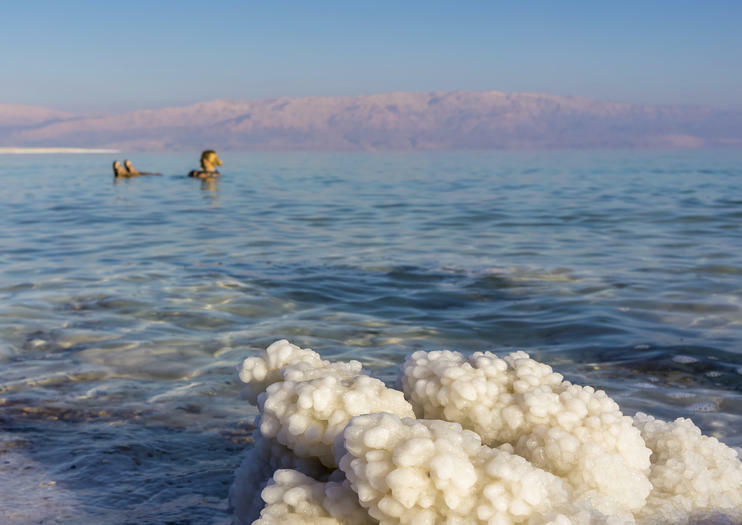 The second saltiest major body of water on earth, the Dead Sea possesses such high salinity that it makes swimmers become super-buoyant. Here’s what you need to know about visiting one of Israel’s top attractions from Tel Aviv. Located 61 miles (98 kilometers) from Tel Aviv at 1,312 feet below sea level, the Dead Sea makes a relatively easy day trip. Tours often include stops in the Judean Desert such as the Inn of the Good Samaritan, the mountaintop Masada fort, the Ein Gedi Oasis, the ancient settlement of Qumran, and the city of Jericho—one of the oldest continually inhabited cities in the world. No matter what tour you choose, you’ll have free time to float in the salty water or take a therapeutic mud bath. With so much to see in the region surrounding the Dead Sea, a multi-day tour becomes an enticing option for those with more time to spare. Lasting anywhere from two to five days, a Dead Sea tour from Tel Aviv might include Jerusalem, Bethlehem, Masada, the caves of Qumran (where the Dead Sea Scrolls were found), Nazareth, and the Sea of Galilee. Day trips to the Dead Sea can last upwards of 12 hours, depending on the option chosen. Combine your visit to the Dead Sea with stops at sites like Masada and Old Jerusalem. A guided tour allows you to see other points of interest on the way to and from the Dead Sea. Multi-day tours take you to Israel’s highlights, including Jerusalem, Bethlehem, and Masada. Some tours include pickup and drop-off at Tel Aviv hotels.